Wayne State College’s Language and Literature Department, the School of Arts and Humanities and the WSC Press are pleased to hold this spring’s Plains Writers Series on Thursday, March 2nd, 2017. The Plains Writers Series is held several times a year in an attempt to bring attention to the prose and poetry of local Great Plains writers through reading and interacting with area audiences. This Plains Writers Series will highlight four authors (left to right in photo): Emily Borgmann, Jeff Alessandrelli, Michael Catherwood, & David Drees . The authors will share selected pieces of their recent works in the lounge on the second floor of the Humanities Building at Wayne State College at 1:00 pm and again at 2:00 pm. 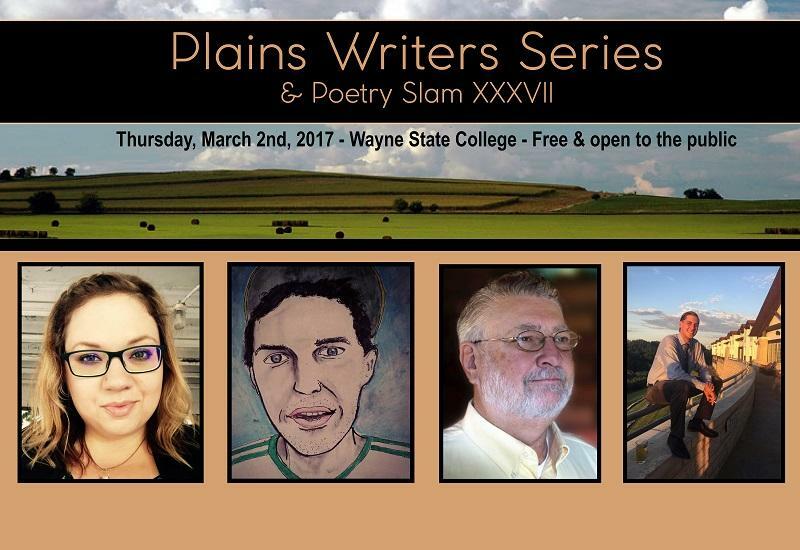 Following the Plains Writers Series will be Poetry Slam XXXVII. The slam will be held at the Max Bar and Grill in downtown Wayne, NE starting at 7:00 pm, with registration starting at 6:00 pm. If anyone would like to participate in the slam they will need 4 original poems and $5 for registration at the door. All events are free and open to the public. Michael Catherwood’s first book was Dare, by The Backwaters Press. His second book, If You Turned Around Quickly, is from Main Street Rag. His third book, Projector, is forthcoming from Stephen F. Austin University Press. His poems have recently appeared in Bluestem, Louisiana Literature, Measure, the minnesota review, New Plains Review, The Common, Red River Review, Galway Review, and other journals. He has taught creative writing at the University of Arkansas, the University of Nebraska at Omaha, and Creighton University. He’s been an associate editor at Plainsongs since 1995, where he writes essays. He is editor at The Backwaters Press. Recent work by Jeff Alessandrelli appears/is forthcoming in Poetry Northwest, Boston Review, Denver Quarterly and The American Poetry Review, among other journals. He’s also the author of the full-length collection THIS LAST TIME WILL BE THE FIRST (Burnside Review, 2014) and five chapbooks. Jeff’s next collection, Nothing of the Month Club, will be out in 2018. He’s currently a staff blogger at The Kenyon Review as well. Additionally, Jeff co-edits the chapbook outfit Dikembe Press, which recently put out works by Christine Hume, Christian Hawkey and Emily Pettit, and directs the vinyl record-only poetry press Fonograf Editions; for the latter outfit Eileen Myles’ Aloha/irish trees was published in May 2016 and Rae Armantrout’s Conflation in November 2016. Emily Borgmann is a poet, essayist, and writing educator. She works as a teaching artist in youth triage and prisons, and as a college writing center consultant. Emily is developing a program featuring writing curriculum adaptive to traumatic-stressed populations for the non-profit The Nebraska Writers Collective. For four years, she has facilitated a community writing group at Youth Emergency Services, an organization fighting youth homelessness in the Omaha metro area, and in 2016 was given their Champion of Youth award for advocacy. Emily holds an MFA from the University of Nebraska, where she received the Helen W. Kenefick prize from the Academy of American Poets. Her poetry and nonfiction have appeared or are forthcoming in such journals as The Laurel Review, Salamander, Alligator Juniper, Skidrow Penthouse, and Green Mountains Review. Her current book project is a memoir-in-essays. Zach Drees is an adjunct English instructor at Northeast Community College and Wayne State College in northeast Nebraska. His work has been published in The Judas Goat, Dancing with Skeletons, Nebby, and Green Mountains Review. His poetry has been twice a runner-up and once a recipient of the Kinefick Prize from the Academy of American Poets. A recent graduate of the University of Nebraska Omaha MFA in Writing program, he resides in Wayne, Nebraska with his girlfriend, Tabetha, and their four-year-old Jack-Russel, Theo.